What Robert Mueller has on Paul Manafort could be the key line of the Russia investigation. Two FBI surveillance orders suggest that the special counsel sees Trump’s former campaign chairman as the key to the Russia investigation. 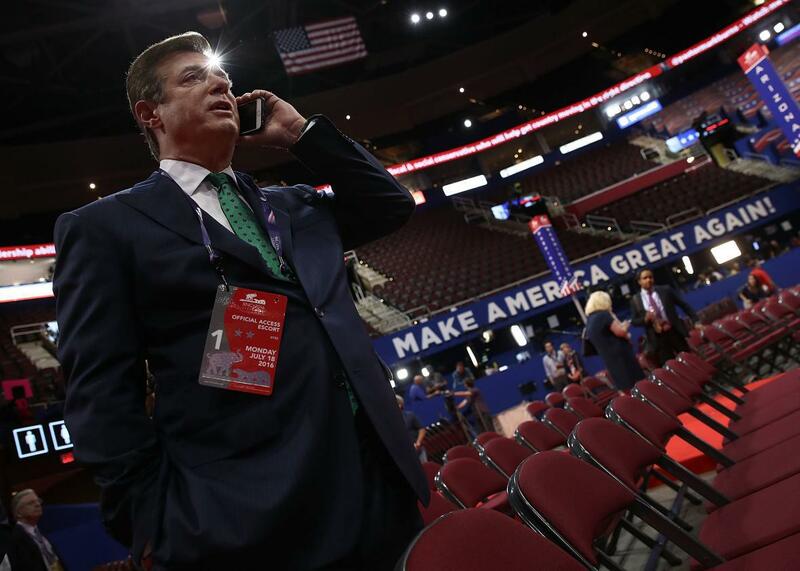 Paul Manafort, then campaign manager for Donald Trump, on the floor of the Republican National Convention at the Quicken Loans Arena on July 17, 2016 in Cleveland, Ohio. The Trump­–Russia saga has more characters than War and Peace and plot twists harder to follow than Game of Thrones. So making sense of the latest news—that the FBI had taken out not one but two surveillance orders under the Foreign Intelligence Surveillance Act on former Trump campaign chairman Paul Manafort—can be difficult to put into context. But this new information can help connect the counterintelligence and criminal investigations that special counsel Robert Mueller is overseeing, and it could show how a FISA warrant may have played a role in each. I have already provided a detailed description of the (onerous) process of obtaining a FISA order and the legal standards it requires. The only thing to add in Manafort’s case is that since he is a U.S. person (or USPER, in intel slang), the standards to obtain a FISA warrant on him are slightly higher than the generic process I described previously. First, for Manafort, the probable-cause standard required the FBI to provide evidence that he was “knowingly engaging in clandestine intelligence activities,” rather than merely being “an agent of a foreign power.” In other words, the bureau had to show some proof that he wasn’t just acting on behalf of a foreign power but that he was doing so with full knowledge that this work involved spying. Second, in order to continue monitoring Manafort, the FBI would have been required to check in with the FISA court every 90 days and show that its surveillance had, in fact, produced foreign intelligence information. Only with this continuing, additional evidence would the FISA order be renewed for an additional 90 days at a time. Keeping these factors in mind, let’s look at what we know. We know that the FBI had one FISA surveillance order on Manafort in or around 2014. This order was in relation to his consulting work on behalf of the pro-Russia ruling party in Ukraine at the time. We also know that the surveillance ceased at some point before Manafort joined President Trump’s campaign in 2016. It then recommenced at some point after that, based on his connections with Russian intelligence and evidence suggesting that he was encouraging those connections to interfere in the presidential election. That surveillance continued into at least early 2017. The “gap” covered the period of time when Manafort, Donald Trump Jr., and Jared Kushner met with Russians at Trump Tower to discuss—depending on whose version you believe—“adoptions” or incriminating information the Russians claimed to have on Hillary Clinton. According to reporting, the initial FISA surveillance ceased after a court found that the FBI was no longer collecting foreign intelligence based on that order. This likely would have occurred at one of the 90-day renewal points after the surveillance began. Why would the FBI have stopped watching Manafort? One conclusion might be that there was no foreign intelligence activity actually happening—or perhaps that the basis for this first order was somewhat flimsy. However, if the order had been renewed at least once since it commenced, which would be likely even if it began in late 2014 or early 2015, that was probably not the case. After all, in order to renew the order at any point prior to it ceasing, the FBI would have had to produce an ongoing foreign intelligence collection. There’s another possibility. If Manafort was already being developed by Russian intelligence agents since 2014 and was approached in a more concrete, operational way around summer 2016, then they would likely want him to begin communicating with them through other means than he was already using. If this happened, intelligence collected on the lines, accounts, or facilities targeted by the initial FISA order would go dry and would explain why the surveillance ceased. In other words, perhaps there was no longer any foreign intelligence activity happening on the first FISA—but that’s because it was happening somewhere else. That the first FISA order might have ceased because Manafort became “operational” is purely speculative. But based on my experience working against foreign intelligence targets, this would be consistent with the timeline in several respects. First, the June 2016 Trump Tower meeting has been characterized by many intelligence experts as a “test run”—an experiment to see how open members of the Trump campaign might be to engaging in some potentially illegal behavior in order to benefit the campaign. Having Manafort already on board would make sense in this scenario: Even if this might have been only an initial approach to Trump Jr. and Kushner, the Russians would know they had at least one person in the campaign—Manafort—at that point who was “all in” and could make the meeting less threatening for the newbies. Third, this theory would explain Mueller’s keen interest in Manafort in particular. Mueller’s investigation is first and foremost a counterintelligence investigation. Regardless of whether Trump Jr. or Kushner had any subsequent meetings or contacts with the Russians or colluded with them in their active measures, the FISAs suggest that Manafort holds the real keys to the kingdom. Namely, how was election interference plan conceived? What operational measures were involved? Was there any quid pro quo? Who else was in on it? Mueller may be just as—if not, more—interested in Manafort spilling the identities and methods of the Russians in this whole scenario as in those of any American members of the Trump campaign who were involved. After all, we know that with the Facebook search warrant that Mueller is potentially interested in pursuing Russians living in Russia who tried to disseminate disinformation in the U.S. He would surely be as interested in identifying and nailing the Russian operatives who participated in active measures to influence the election here in the States. Which brings us to Mueller’s criminal investigation on Manafort. To get Manafort to talk, Mueller needs some, shall we say, “incentives.” The prospect of serious jail time for not cooperating is usually effective. The problem is that, for all of Manafort’s red-flaggy behavior with the Ukrainians and the Russians, there aren’t really a lot of laws against spying. There’s the Espionage Act, which relates to defense and classified information and doesn’t apply in the current scenario. And there’s the Foreign Agent Registration Act, which as Steve Vladeck explains is a procedural statute: People or entities officially designated as foreign agents must register if the Department of Justice asks them to, but if they comply with that request, they may be out of the crosshairs of criminal prosecution. Manafort retroactively registered as a foreign agent in June. Even if Mueller chose to prosecute Manafort’s failure to register earlier, FARA carries a weak penalty—only a five-year maximum—and has a low likelihood of being able to prove willful evasion of the law. Because of that combination, FARA alone likely wouldn’t create enough leverage for Mueller. Financial crimes, by contrast, carry significant penalties, particularly when multiple charges are added together. Here is where the FISA orders could have come into play again. It’s important to emphasize that the goal of using a FISA warrant is not to collect evidence of a crime; it’s to collect foreign intelligence information. However, since 9/11 and the passage of the Patriot Act, evidence of criminal activity that is obtained through the course of a FISA investigation can be used to open a criminal case, as long as a “significant purpose” of the FISA inquiry was to obtain foreign intelligence. Here, the FISA warrants on Manafort were based on his intelligence connections. But if he was engaging in financial shenanigans, related or unrelated to his alleged intelligence activities, signs of it may have become apparent during the FISA monitoring, allowing the FBI to open a separate criminal case on Manafort—which is where we are now. We don’t know the content of the communications monitored under the FISA orders, which might really add the missing links to what connections, if any, existed between the Trump campaign and Russia. But the existence of the FISA warrants themselves on Manafort, and their timing, gives us a way to understand the facts so far. So even if, like me, you’ve never made it all the way through War and Peace (I don’t even watch Game of Thrones), you can still follow along with Mueller: There’s a method to his madness against Manafort. *This piece has been updated since publication with additional information about the implications of the Foreign Agent Registration Act.